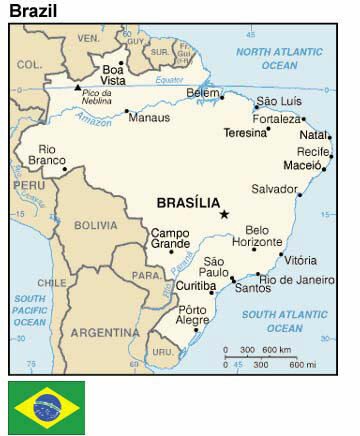 Brazil is the only Portuguese-speaking nation in the Americas. About three quarters of all Brazilians belong to the Roman Catholic Church; most others are Protestant , members of a growing evangelical movement, or follow practices derived from African religions. From 1889 to 1930, the government was a constitutional republic, with the presidency alternating between the dominant states of Sao Paulo and Minas Gerais. This period ended with a military coup that placed Getulio Vargas, a civilian, in the presidency; Vargas remained as dictator until 1945. Between 1945 and 1961, Jose Linhares, Gaspar Dutra, Vargas himself, Caf� Filho, Carlos Luz, Nereu Ramos, Juscelino Kubitschek, and Janio Quadros were elected presidents. When Quadros resigned in 1961, Vice President Joao Goulart succeeded him. President Lula, a former union leader, is Brazil's first working-class president. Since taking office he has taken a prudent fiscal path, warning that social reforms would take years and that Brazil had no alternative but to maintain tight fiscal austerity policies. Economic growth in 2004 and the first half of 2005 was strong with increases in employment and real wages. Growth slowed somewhat in the second half of 2005, but has accelerated in 2006. President Lula was re-elected October 29, 2006 in a second round victory with over sixty percent of the vote, over Geraldo Alckmin of the PSDB. Lula�s PT party failed to win a majority in either the lower or upper houses in concurrent legislative elections and will be obliged to form a coalition with the centrist PMDB party -- which won the most seats in the lower house and may end up with the largest number in the Senate -- and a collection of minor parties. However, party loyalty is weak in Brazil, and it is common for politicians to switch parties, changing the balance of power in Congress. The PT won five of twenty-seven governorships, but the opposition PSDB remains in control of the critical states of Sao Paulo and Minas Gerais. The PMDB, as in the legislative elections, won the most governorships of any one party, controlling seven states. Because of the mandatory revenue allocation to states and municipalities provided for in the 1988 constitution, Brazilian governors and mayors have exercised considerable power since 1989. Lula�s electoral victory came despite a series of corruption scandals that resulted in the resignation of senior PT officials and the electoral defeat of several congressmen from parties allied to the PT. At least four congressional investigations are ongoing, though Lula has yet to be personally linked to any of the scandals. Brazil's economy, aided by a benign international environment, grew approximately 2.3% in 2005 and 4.9% in 2004. Sustained growth, coupled with booming exports, healthy external accounts, moderate inflation, decreasing unemployment, and reductions in the debt-to-GDP ratio. President Lula and his economic team have implemented prudent fiscal and monetary policies and have pursued necessary microeconomic reforms. Brazil has made progress but significant vulnerabilities remain. Despite registering its first year-on-year decline in 2004, Brazil's (largely domestic) government debt remains high, at 51% of GDP. Total foreign debt, while falling, is still large in relation to Brazil's export base. Over time this concern will be reduced by healthy export growth, which has anchored the positive trade and current accounts. Personal incomes improved in 2004 and 2005 after a significant decline over the previous decade. Income and land distribution remains skewed. To increase its international profile (both economically and politically), the Lula administration is seeking expanded trade ties with developing countries, as well as a strengthening of the Mercosul (Mercosur in Spanish) customs union with Uruguay, Paraguay and Argentina. In 2004, Mercosul concluded free trade agreements with Colombia, Ecuador, Venezuela and Peru, adding to its existing agreements with Chile and Bolivia to establish a commercial base for the newly-launched South American Community of Nations. Mercosul is pursuing free trade negotiations with Mexico and Canada and has resumed trade negotiations with the EU. The trade bloc also plans to launch trilateral free trade negotiations with India and South Africa, building on partial trade liberalization agreements concluded with these countries in 2004. In July 2006, Venezuela was admitted to the trade bloc as a full member China has increased its importance as an export market for Brazilian soy, iron ore and steel, becoming Brazil's fourth largest trading partner and a potential source of investment. In 2003, Congress passed Lula's key reforms of the public sector pension system and the tax code. The 2004 legislative season was not very productive, in part because of a political scandal early in the year followed by campaigning for the October municipal elections. In December 2004, several key bills passed into law, including a reform of the judicial system, a modern bankruptcy law, and Public Private Partnerships to fund infrastructure projects. In March 2005, a law to legalize biotechnology crops and stem cell research passed. The domestic political scandal, which surfaced in June 2005 and led to multiple congressional investigations, sidetracked most reform legislation for the remainder of the 2005 and 2006 sessions. Agriculture is a major sector of the Brazilian economy, and is key for economic growth and foreign exchange. Agriculture accounts for 10% of GDP (30% when including agribusiness) and 40% of Brazilian exports. Brazil enjoyed a positive agricultural trade balance of U.S. $38 billion in 2005. Brazil is the world's largest producer of sugar cane, coffee, tropical fruits, frozen concentrated orange juice (FCOJ), and has the world's largest commercial cattle herd (50% larger than the U.S.) at 170 million head. Brazil is also an important producer of soybeans (second to the United States), corn, cotton, cocoa, tobacco, and forest products. The remainder of agricultural output is in the livestock sector, mainly the production of beef and poultry (second to the United States), pork, milk, and seafood. In 2001, Brazil experienced an electricity crisis due to inadequate rainfall for its hydroelectric system and insufficient new investment in the sector. Mandatory rationing and price hikes were sufficient to prevent blackouts. The rationing system officially ended on March 1, 2002. Lula�s then-Energy Minister unveiled an energy plan in July 2003, which left many vital details undefined and most investors dissatisfied. The Government of Brazil has undertaken an ambitious program to reduce dependence on imported oil. In the mid-1980s, imports accounted for more than 70% of Brazil's oil and derivatives needs; the net figure is nearing zero. Brazil is expected to become a net exporter of oil by the end of 2006 as output from the Campos Basin continues to increase. Brazil is one of the world's leading producers of hydroelectric power. Of its total installed electricity-generation capacity of 90,000 megawatts, hydropower accounts for 66,000 megawatts (74%). The relationship between Brazil and the U.S. strengthened with the inauguration of Brazil's internationally oriented, reformist President Fernando Henrique Cardoso in 1995. President Bush invited then President-elect Lula to Washington for a meeting in December 2002. President Lula again visited Washington for a summit on June 20, 2003. Documents covering the results of the summit can be found on the White House and State Department web sites. Deepening U.S.-Brazil engagement and cooperation are reflected in the numerous recent high-level contacts between the two governments, including visits to Brazil by President Bush in November 2005 (see Joint Statement), Secretary of State Condoleezza Rice in April 2005 and then-Secretary of State Colin Powell in October 2004, Defense Secretary Donald Rumsfeld in March 2005, Treasury Secretary John Snow in August 2005, and Commerce Secretary Carlos Gutierrez in June 2006,. Brazilian Foreign Minister Amorim and many other members of President Lula�s cabinet have visited the U.S. Ongoing topics of discussion and cooperation include trade and finance; hemispheric economic integration; Free Trade Area of the Americas; regional security; nonproliferation and arms control; human rights and trafficking in persons; international crime, including financial support to terrorist groups; counter-narcotics; and environmental issues. Existing bilateral agreements include an Education Partnership Agreement, which enhances and expands cooperative initiatives in such areas as standards-based education reform, use of technology, and professional development of teachers; a Mutual Legal Assistance treaty--ratified in 2001; and agreements on cooperation in energy, the environment, science & technology, and transportation. The U.S. embassy and consulates in Brazil provide a wide range of services to U.S. citizens and business. Political, economic, and science officers deal directly with the Brazilian Government in advancing U.S. interests but also are available to brief U.S. citizens on general conditions in the country. Attach�s from the U.S. Commercial Service and Foreign Agriculture Service work closely with hundreds of U.S. companies that maintain offices in Brazil. These officers provide information on Brazilian trade and industry regulations and administer several programs to aid U.S. companies starting or maintaining business ventures in Brazil. The number of trade events and U.S. companies traveling to Brazil to participate in U.S. Commercial Service and Foreign Agriculture Service programs has tripled over the last three years. The consular section of the embassy provides vital services to the estimated 60,000 U.S. citizens residing in Brazil. Among other services, the consular section assists Americans who wish to participate in U.S. elections while abroad and provides U.S. tax information. Besides the U.S. residents living in Brazil, some 150,000 U.S. citizens visit annually. The consular section offers passport and emergency services to U.S. tourists as needed during their stay in Brazil.